Before your coronary artery bypass graft (CABG), your surgeon will discuss every aspect of the procedure with you. This will give you the opportunity to ask any questions to make sure you understand the procedure fully. As the procedure is carried out using a general anaesthetic (where you're asleep during the operation), you mustn't eat or drink for at least 6 hours before the operation. You may be able to have occasional sips of water up to 2 hours before the operation. Coronary artery bypass graft surgery usually lasts 3 to 6 hours. But it may take longer depending on how many blood vessels are being attached. Blood vessels can be taken from your leg (saphenous vein), inside your chest (internal mammary artery), or your arm (radial artery). 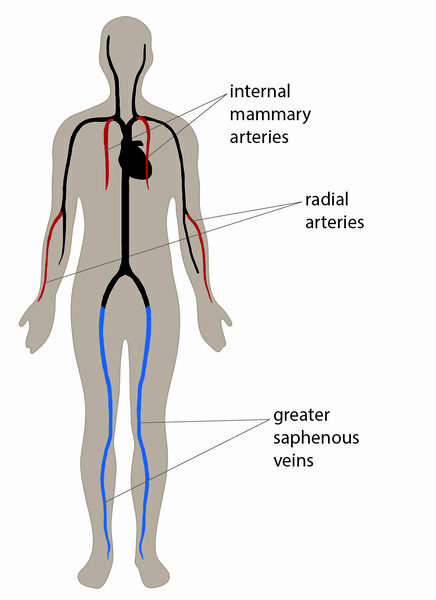 Other blood vessels in these areas are able to compensate for the loss of these blood vessels after the operation. The number of blood vessels used will depend on how severe your coronary heart disease is and how many of the coronary blood vessels have become narrowed. If you need 2, 3 or 4 grafts, you may hear your operation referred to as a double, triple or quadruple bypass. One of the graft vessels is usually taken from your chest (internal mammary artery). Surgeons prefer to use this vessel because it doesn't narrow over time, unlike the blood vessels taken from your leg or arm. Once all the graft vessels have been removed, your surgeon will make a cut down the middle of your chest so they can divide your breastbone (sternum) and access your heart. During the procedure, your blood may be rerouted to a heart-lung bypass machine. This takes over from your heart and lungs, pumping blood and oxygen through your body. Your heart will be temporarily stopped using medication while your surgeon attaches the new grafts to divert the blood supply around the blocked artery. After the grafts have been attached, your heart will be started again using controlled electrical shocks. Your breastbone will then be fixed together using permanent metal wires and the skin on your chest sewn up using dissolvable stitches. More surgeons are now performing off-pump coronary artery bypass surgery (OPCAB), which is a variation of the conventional procedure. A coronary artery bypass graft is often described as on-pump surgery because it involves using a heart-lung bypass machine to pump blood and oxygen around your body during the procedure, while the heart is temporarily stopped. During OPCAB, your heart is still beating while the new blood vessel grafts are attached and a heart-lung bypass machine isn't used. According to the National Institute for Health and Care Excellence (NICE), the procedure works as well as a coronary artery bypass using a pump. The main disadvantage is that OPCAB is more technically demanding because the grafted vessels have to be delicately connected while the heart is beating. This means the procedure may be too difficult to perform if a large number of blood vessels need to be grafted. For the same reason, if emergency surgery is required, there may not be ready access to a surgeon with the training required to perform an OPCAB. Read the NICE guidelines about off-pump coronary artery bypass grafting. Endoscopic saphenous vein harvesting (ESVH) is a less invasive method of removing the veins from your legs. Rather than making a large cut in your leg, the surgeon makes a number of small ones near your knee. This is known as keyhole surgery. A special device called an endoscope will be inserted into the cut. An endoscope is a thin, long flexible tube with a light source and video camera at one end, so that images of the inside of your body can be relayed to an external television monitor. The endoscope allows the surgeon to locate your saphenous vein. Surgical instruments can also be passed along the endoscope to remove a section of the vein. Nearby tissue is then sterilised with antibiotic fluid and the cut is healed. Read the NICE guidelines about endoscopic saphenous vein harvest for coronary artery bypass grafting. Totally endoscopic robotically assisted coronary artery bypass (TECAB) grafting is a newer technique in heart surgery. It's a minimally invasive (keyhole) method of performing a heart bypass. During a TECAB grafting procedure, the surgeon deflates your lungs and makes a number of small cuts between your ribs. Robotic arms, controlled by the surgeon, are used to carry out the surgery. An endoscope is attached to the robotic arms so the surgeon can see inside your body and view the results of the surgery on a screen. TECAB grafting can be carried out using a heart-lung bypass machine, or it can be done off-pump. There are lower rates of wound infection with this type of surgery, plus minimal scarring and a faster recovery time. But as this is a new technique that's only been carried out on a small number of people, it's difficult to assess how effective and safe it is in the short and long term, and how the outcomes compare with other types of surgery. If you're considering having TECAB, it's important you understand there are still uncertainties about how safe the procedure is and how well it works. Read the NICE guidelines about totally endoscopic robotically assisted coronary artery bypass grafting.